Burma apart from being a stunningly beautiful country that had largely been kept out of the international eye is also home to an ancient and fascinating way of life and therefore, has a great many secrets and experiences to slowly reveal to the world as the process of traveller entry is eased throughout the country. One of the aspects best showing the grace and charm of the Burmese people is its world of hand crafted goods and skills. Not only are these completely internal artifacts beautiful but they reveal an astonishing amount of meticulous hand working skills and a great patience to exhibit such exquisite finesse. The ancient art of lacquering has been handed down by the Chinese through the mountainous northern border lands and lovingly adopted by the Burmese throughout the land. Locally termed as pan yun, it is one of the customary arts and crafts of Burma. Excavated lacquer-ware dates back as early as 1274 AD. One of the museums in Bagan have in its display this ancient technique of finishing which includes Buddha images, jars, plates – all showing the intricacies and the keen detail that is being put in on each object. The skills and practices of this incredible art form have been completed remembered and kept in the way it was originally developed. What most travelers will not realize, however, is the incredible painstaking operation of teamwork and timing it brings to the fore. The lacquer itself is mixed with ash until it forms into a rubber like state and can then be worked upon intricately to give the desired look. The long commitment of the work can then undergo repeated effort as the true desired effect begins to come to hand. This can produce layer upon layer of craftsmanship which gives off the finished appeal that is enjoyed and wondered at by many onlookers and customers. The finished product is a lustred substance that becomes as hard as stone and adds a very reliable protective coating to the wondrous work within. The beautiful effects when delicately balanced with color are always a site to be marveled at. The many layers of lacquering are neatly applied by rubbing in the color as opposed to painting on. If you look closely you will notice the difference which, incidentally, is the easiest way to see if you are holding a fake painted version. Each layer requires a separate drying process and cannot be touched for up about a week. When you investigate these wonderful pieces further you will learn how many layers some of these works of art have included in their finish, so a quick calculation will tell you what a real labor of love this dedication represents. 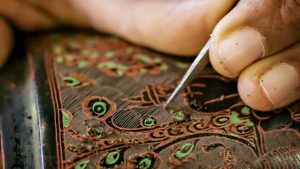 It is not uncommon to find a beautifully ornate carved box that has had perhaps one hundred layers applied to it. This is why holding a stunning vase or jar gives such a revealing lesson in hand craft appreciation as it rarely can be found better than this. You will no doubt discover many places on your travels selling and demonstrating the skilled artwork of the traditional artisans so stop and spend a little bit of time to understand you are looking upon the real lacquer ware and not cheaper fakes waiting upon the next group of unsuspecting tourists whisked on and off their buses without the chance to look and take care more closely. This age old tradition has been passed on to generation after generation, not only maintaining the skills but also the history and spirituality that go with the Burmese culture.